When you decide to take on a pet, it is a big responsibility. Pets require a lot of time and love. 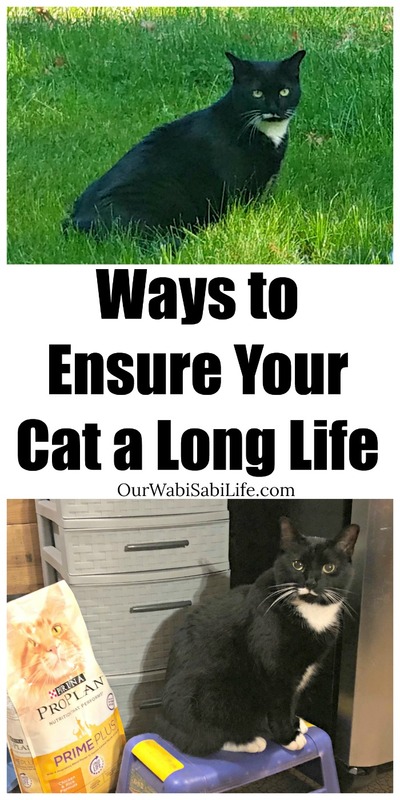 There are some things that you can do to ensure your pet has a long life. Everything from what you feed your pet to their bedding options and vaccines are part of ensuring your pet a long life. Here are just a few things that you should know when adopting a new pet into your home. I have had many pets over my life. Actually, I can’t remember a time when we didn’t have a pet. Currently, we have 2 cats, one who is 7 and one who is 8 weeks old, and a dog, who is 7 months old. I am a firm believer in rescuing any animal that we have because these are the animals that truly need us. Boots, our 7-year-old cat, was in a shelter that did not have a no-kill policy and she was on her last day. As soon as we saw her, we knew, she needed us. And she was home with us that night. She has been one of the sweetest cats I have ever had. How no one took her home sooner, I will never understand. Our other kitty, KitKat was found in the middle of the road when she was about 3 weeks old. She was so sick. In the 5 weeks that we have had her, she has been to the vet 4 times. She is almost up to being at full health. Hopefully, by her next visit, she will be ready for her vaccines. Our puppy was rescued from an abusive puppy mill. She was timid and shy and wasn’t bought like her littermates. She was on her way to being a breeder dog when we found her and brought her home with us. My pets mean the world to me and it is a high priority that I keep them healthy. While that can entail a lot of effort, it is always worth it and rewarding. When one of my animals comes and lays on my lap, there is no better feeling. How do you keep your pets healthy? What are the best ways to keep pets healthy and happy? Your pet should have regular vet visits for vaccines as well as physical checkups. An annual vet visit will be best. Pets need to have routine check-ups to make sure they are growing and that is no health problems that are not showing symptoms yet. Pets that have regular vaccinations are less likely to develop preventable infections. Your veterinarian will be able to provide you with details on necessary vaccines and other health tips for your pet to live a long life. Dental disease and oral health issues are very common in cats and dogs in particular. Your vet will check your pet’s teeth and gums during annual visits but be sure to brush your pet’s teeth and provide them with dental type treats geared towards keeping their teeth and gums clean. The overgrown hair on your pet can develop snarls as well as collect ice chunks during the colder season if they’re an outdoor pet. Be sure to groom your pet by not only keeping their hair brushed, but trim their nails. Long nails can create walking problems and health issues with your pet. It’s important to keep your pet lean because obesity in pets causes health issues just like obesity in humans. It has been proven that an overweight pet can have a reduction of 2 years off of their lifespan. Being overweight also puts your pet at risk for heart disease and joint problems. Boots is 7, which means she is getting to the senior years for a cat. She has different nutritional needs than KitKat. 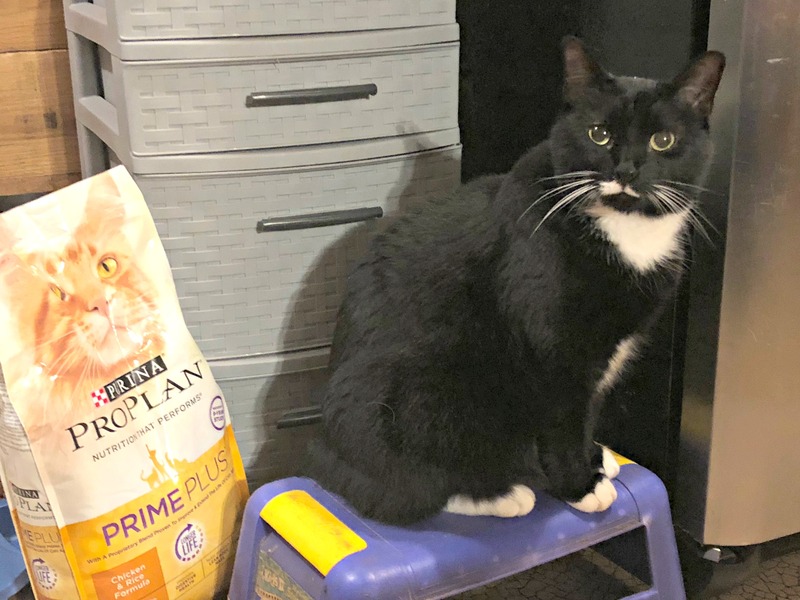 Boots need a cat food formula like Purina® Pro Plan® Prime Plus™. 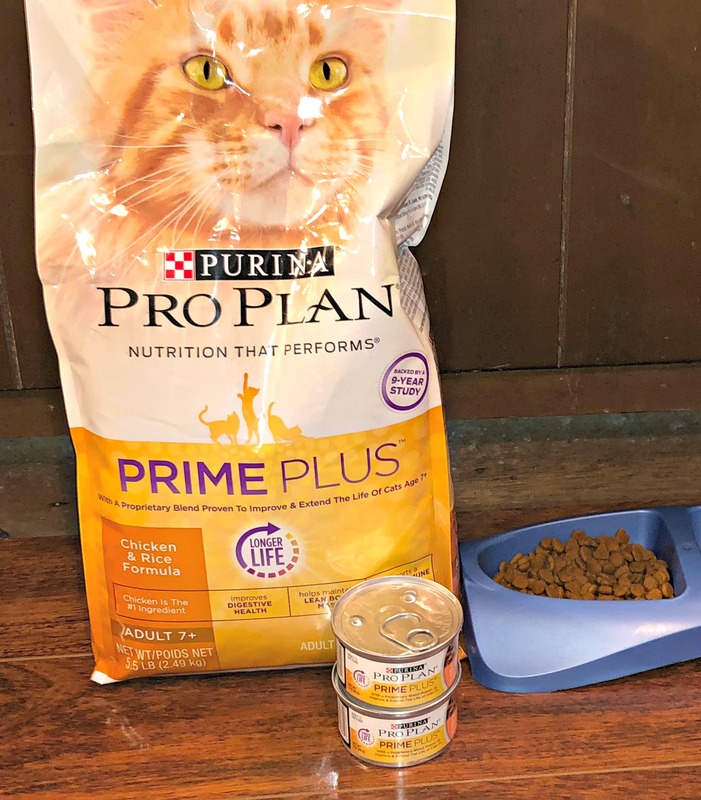 Backed by a 9-year study, the Prime Plus is a cat food that is designed to extend the life of cats age 7 and older, based on cats who were exclusively fed a complete diet with the proprietary blend vs. cats fed the complete and balanced diet alone. Purina® Pro Plan® Prime Plus™ is available at PetSmart. 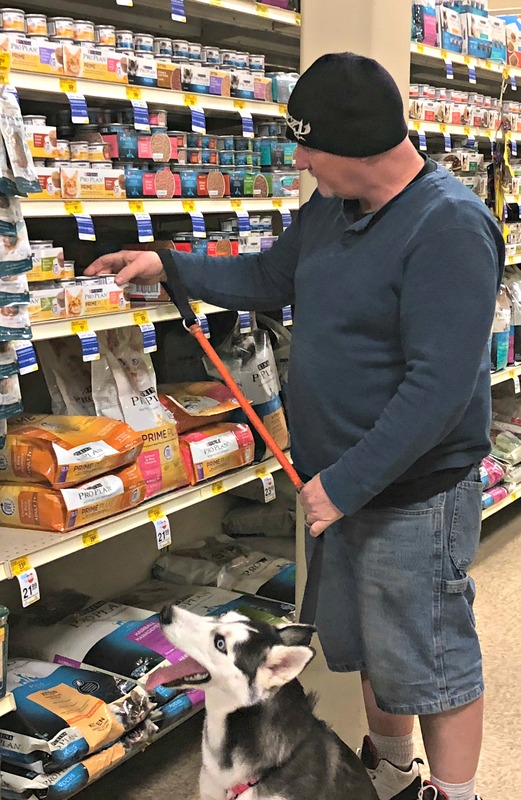 What makes PetSmart the perfect place to buy your pet’s food? PetSmart has everything you need for your pets, with a large selection. What makes it even better? Bring your pet with you. Why I wouldn’t bring Boots with me, she certainly wouldn’t enjoy it, I love to bring our puppy, Naomi. She loves to see the other dogs and she loves that she always leaves with a new toy or a special treat. Here is a money saving offer from PetSmart. Get a $10 PetSmart gift card when you spend $40 on Purina® Pro Plan®. (Make purchases from 10/15/18 –11/24/18. Upload receipt by 12/1/18.) The Offer will be fulfilled within 8–10 weeks from the submission date. Making sure you follow these healthy ways to ensure your pet a long life will help minimize health issues and veterinarian costs. Raising a pet is a big deal and is not to be taken lightly. Follow a healthy diet to keep your pet lean while continuing regular vet visits and grooming your pet on a regular basis to ensure your pet a long life.